Now 48-year-old Indigenous campesina Máxima Acu?a de Chaupe, whose family has been on the receiving end of physical and psychological abuse at the hands of Newmont security for years and who the company has tried to force off their land, is seeking justice in U.S. courts to end the violence and impunity. 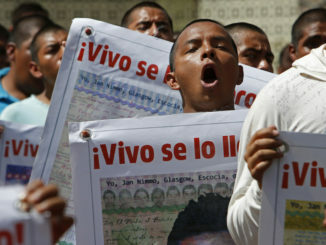 “Apart from these physical attacks, we have suffered emotionally and psychologically. Our dignity and reputation has also suffered,” said Acu?a, who filed a lawsuit with EarthRights International?in a Delaware federal court on Sept. 15 against Newmont and three of its corporate affiliates. “This case is about Newmont Mining Corporation and several of its subsidiaries instructing, authorizing, aiding and abetting, conspiring in and/or ratifying a violent harassment campaign” against Acu?a’s family, the lawsuit states, while other community members opposed to the mining project have been caught in the crossfire. In August 2011, armed security showed up to Acu?a’s home in an attempt to forcibly evict her and her family, and after she refused to leave her land at their request, the agents beat her and one of her daughters and destroyed her home. 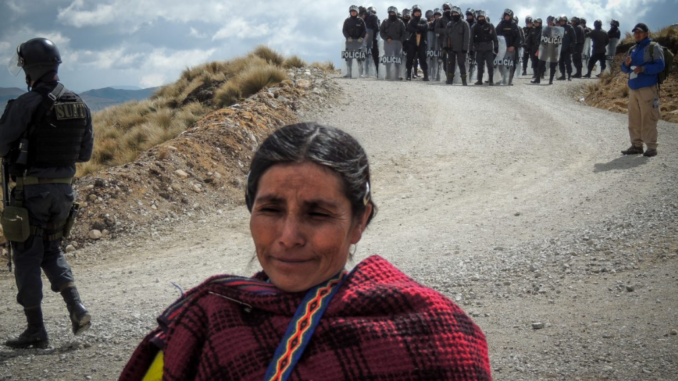 Then in November 2011 and July 2012 the Peruvian National Police, under contract with Newmont, attacked protestors demonstrating against Newmont’s project, injuring several people and killing five. Acu?a was attacked again in February 2014 and September 2016 by Yanacocha security. 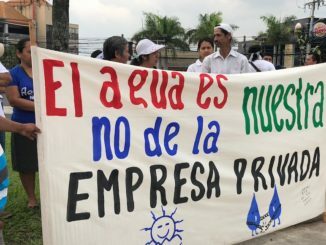 Now, even though the company abandoned the project in December 2015 due to community opposition after suspending construction four years earlier in the wake of 11 straight days of massive protests rocked the region of Cajamarca, Newmont hasn’t stopped using Peru’s court system to further harass Acu?a and attempt to steal her land. However, in May, Peru’s Supreme Court rejected an appeal filed by the company against a previous ruling to a suit filed in 2011 that ruled Newmont’s claims that Acu?a “usurped” company land were unfounded. The EarthRights lawsuit refers to this as part of “a series of sham lawsuits” as part of a broader judicial campaign of harassment. ? If the lawsuit actually goes to trial, it could take months before reaching a ruling. In a region where there were?60 assassinations of environmental defenders last year, time is not on Acu?a’s side.